At the end of the night, the election result in South Australia is extremely close, and we don’t know who will be forming government. The electorate of Mitchell is the closest seat, with the Liberal Party leading by 148 votes at time of writing. However, there are ten electorates with margins of less than 1000 votes: with each major party leading in five. If there is a substantial shift in these seats, either side could form a majority government. Altogether, the ALP is leading in ten electorates by a margin of less than 6%, which gives you a sense of how Labor managed tonight’s result. Despite losing the two-party-preferred result by a handy margin, the ALP is leading in the seat count and has a shot at forming majority government. While the Liberal Party holds three seats by over 70% and a further ten with margins between 60% and 70%, the ALP holds only nine seats with margins over 60%, and none with margins over 70%. This means that the ALP doesn’t ‘waste’ as many votes in safe areas – instead focusing their vote in areas where they can make a difference. I’ll return to the topic of South Australia’s electoral system in coming days. There was a swing towards the ALP in nineteen seats, despite the statewide trend. The swing against the ALP ranged up to over 11% in Stuart and over 21% in Chaffey, and on the other hand the ALP gained 4.5% in Hammond. The Shooters and Fishers are not out of the game, possibly at the expense of either the Greens or the final Labor candidate, but the Greens vote has been rising as the number of votes counted has increased. Finally, I’ve posted below an image of the new electoral map of Adelaide. 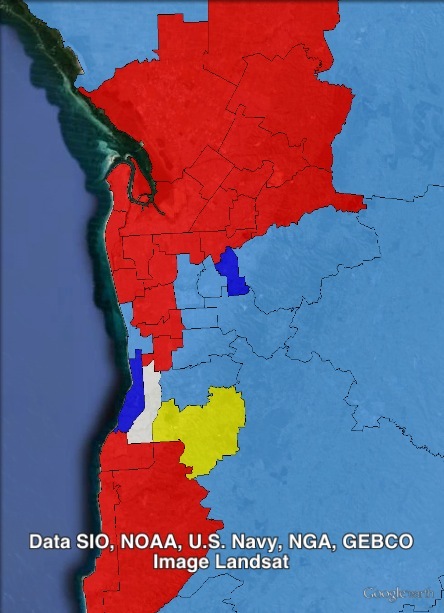 Mitchell is marked in white, and the two other seats the Liberals have gained off the ALP (Bright and Hartley) are in a darker shade of blue. Thanks Ben, with Stewart in the Phillipines, I am totally dependent on your analysis. Fantastic website!